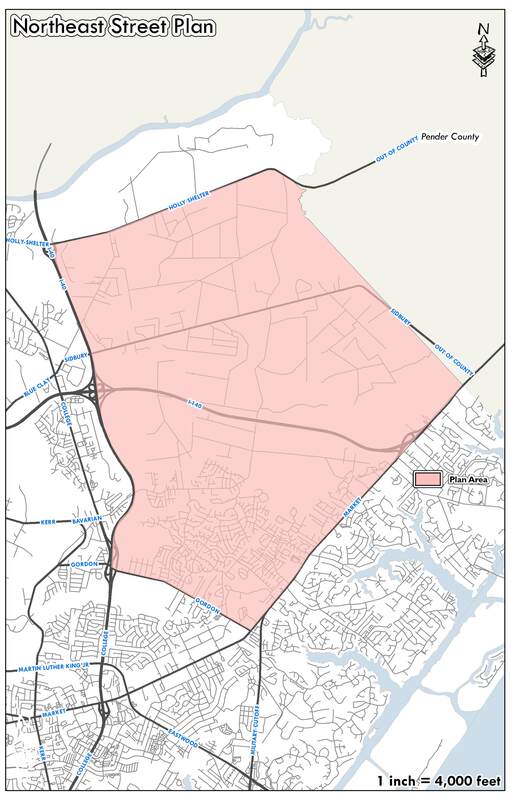 New Hanover County and the Wilmington Urban Metropolitan Planning Organization (WMPO) are partnering to develop a Future Street Plan for northeastern New Hanover County. This plan will study the existing street system in the northeastern area of the county and develop a framework for a future street system to serve residents better. 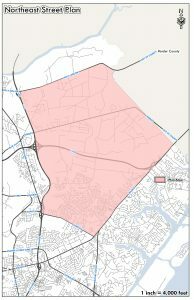 The study area is bound by Holly Shelter Road and the county line to the north, I-40 to the west, US 17/US 17 Business (Market Street) to the east, and Gordon Road to the south. The county and WMPO are working with a transportation consulting firm to study how well the existing transportation system performs in the northeastern area of the county and create ways to integrate land use and transportation development. For example, it will include recommended street-design guidelines that include opportunities for walking and biking. The plan will consider the impacts of the street network on public health, traffic safety, emergency management, and access for existing and future residents. The planning process is currently expected to conclude by early 2019. New Hanover County has received input from residents and property owners in the area through two public workshops and multiple stakeholder interviews. During public workshops, county staff and the consultants provided information on the project and received input from residents about their goals for improving transportation in the northeastern section of the county. A survey was also conducted for residents to provide feedback. In addition, a Technical Advisory Panel, made up of representatives from the county, WMPO, NC Department of Transportation, and other organizations, have helped to guide the planning process. Until the adoption of the county’s first Comprehensive Plan, Plan NHC, in August 2016, the majority of the northeastern area was outside of the county’s urban services boundary. This meant that public utilities were unavailable. Now that water and sewer can be extended, there will be more opportunities for future development. When areas are developed before a comprehensive transportation network plan is in place, it can cause traffic congestion and reduce the quality of life. This plan can help avoid those issues in the northeastern area of the county. Below are maps and documents pertaining to the Future Street Plan project. The citizens of New Hanover County provide input during the planning process. New Hanover County establishes subdivision and other regulation that determine how roads are constructed. The WMPO plans for major transportation projects in New Hanover County and parts of other surrounding counties, developing transportation plans to guide how state and federal funds are spent. The North Carolina Department of Transportation (NCDOT) builds and maintains roads. New transportation projects go through an extensive state-wide vetting process, so new NCDOT roads are reserved for major transportation projects. For most new public roads, developers construct them to NCDOT standards as part of their project and dedicate them to the public. NCDOT has policies and procedures for when and how these roads can become part of the state system. Private developers most frequently build new roads in the unincorporated areas of the county. Currently, the developer can designate these roads as “private,” in which case they will be maintained by a property owner’s association. The planning process will allow these stakeholders to determine the best way to coordinate the process for developing a street network that will meet the needs and goals of citizens. For more information on the Future Street Plan, please contact Ken Vafier, Planning Manager with New Hanover County. Media requests should be sent to Jessica Loeper, New Hanover County Communications & Outreach Coordinator.